Cupcakes 'n Daisies: Time for a Change . . . . It's the first of the month, time to swap out the quilt I have hanging in my living room. 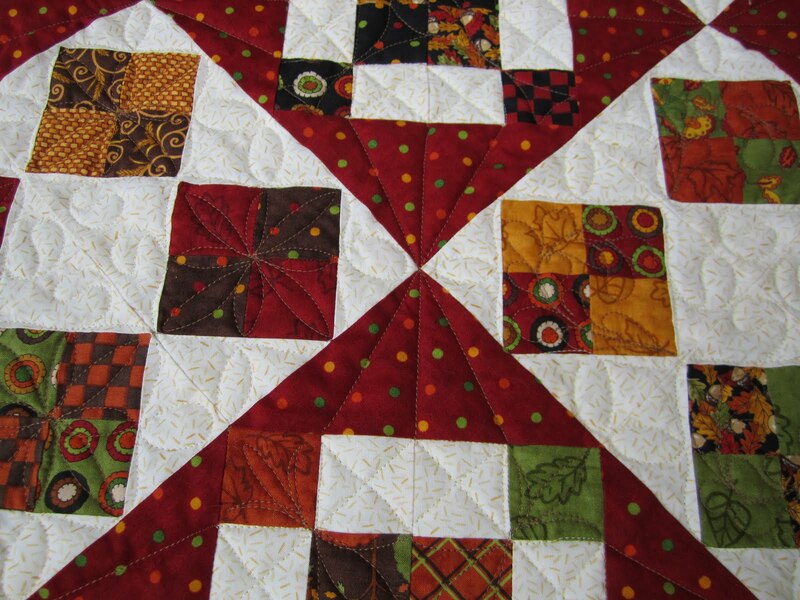 With it being summer, I'm really being diligent about not having one quilt hang up there too long, I'm worried about sun damage, wouldn't that be heart breaking, to ruin a quilt like that! Other than the climbing that ladder thing, I'm glad I have an excuse to get another quilt out. It's Route 44, you've not seen this quilt since it got back from the quilter! I think it's a good late summer, early fall quilt to have out. 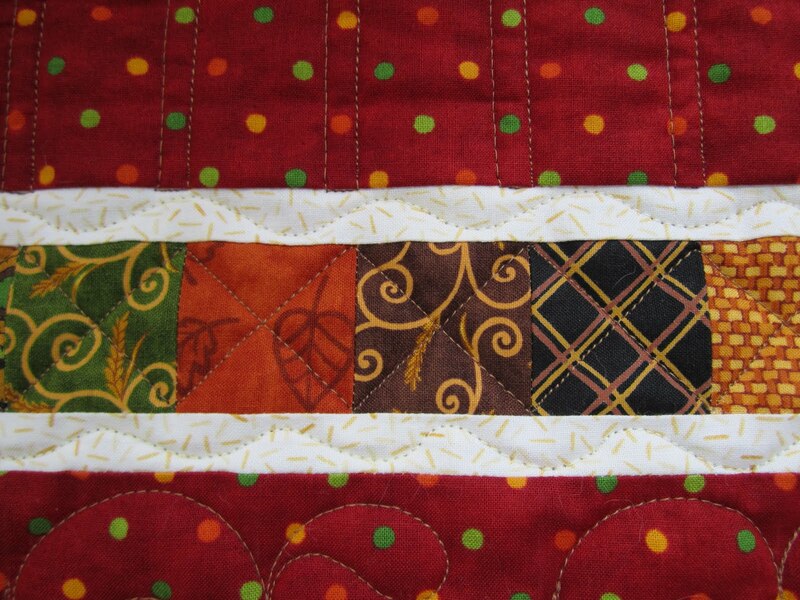 The red dot fabric reminds me of summer fairs and the greens and golds are a nice transition to fall. I'm so happy to finally have a polkadot quilt in my collection. The fabric is Saltbox Harvest by Deb Strain for Moda. Connie at Quilts Plus did a wonderful job quilting this top. Each small square in each block has a different design. I also like that "bow tie" looking design in the red polkadot corner triangles. The designs vary, leafy stems, like in these blocks, to flowers, geometric designs, I don't know how Connie came up with 49 different patterns. The inner border looks great too. 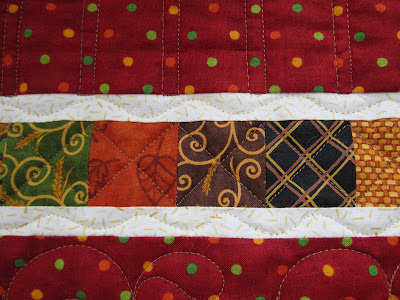 What to do with a plain outer border, how about jazzing it up with a quilting design that looks like a piano key border? Here's the back, the penny rug print that was my original choice for the front of the quilt, until I decided it was too busy, is now on the back. I made this quilt last fall will attending a class taught by Carrie Nelson, the designer of this pattern, Route 44. Over the weekend, when I was helping someone track down the Miss Rosie pattern American Pie, the pattern I used for the border on my A la Mode quilt, I ran across some reviews on Amazon. 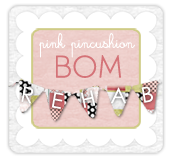 Several reviewers left comments on the large number of pieces in so many of Carrie's patterns. Something I had never thought about. But looking at Route 44, I would have to say it's the pieces that make it so stunning, and number of pieces does not translate to hard. This quilt was pure joy to make. It's one of my favorites. I'm still working on my Red and White Tribute Quilt, I didn't make my end of July deadline, but the finish line is in sight, stop back by for updates. I love seeing which quilt you put on your wall each month. This one is another beauty! oh the quilt looks great hanging there, makes me think of apple picking! people that complain about too many pieces just need to just a bunch of twelve inch squares and sew them together to make giant 9 patches. It looks so beautiful hanging there! The quilting details are amazing! Thelma, would you tell me again about the ring clips you use to hang your quilts on the rod? Bill is going to put in a rod for me to hang a display quilt in the studio,and I want to use what you are using. Sewing casings onto the backs of my quilts just is not going to happen. Autumn is my favorite season. I LOVE this quilt. It's so beautiful!! 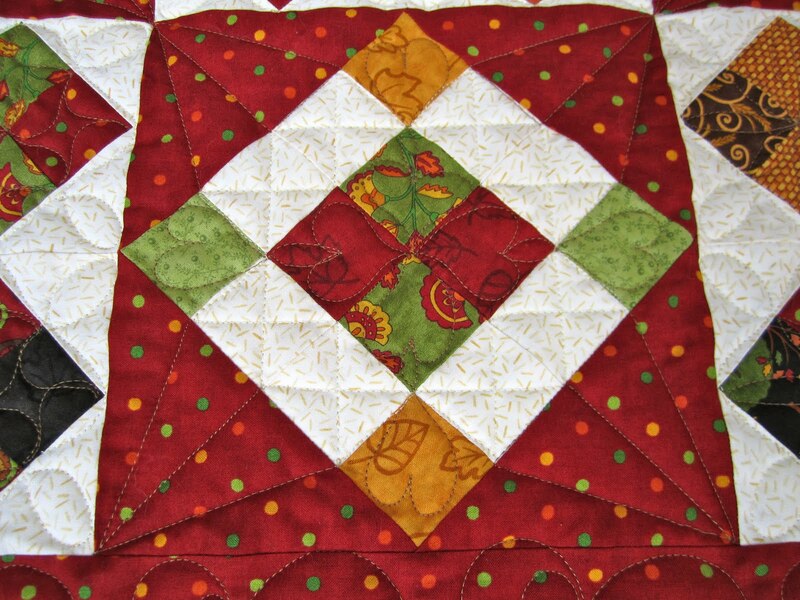 Your Route 44 is a great quilt - perfect for this time of the year! The beautiful reds, yellow-golds, and greens work perfectly together. Love the polka dots too. The LAQ did a great job on the quilting too! I just love this quilt Thelma. Just perfect for the end of summer going into fall time of year. Fall is my favorite time of year. Your quilt is beautiful, and like you, I love Carrie's designs. I seem to like blocks/quilts with a lot of pieces so they are all right up my alley. Wonderful Quilt. I loved all the details! I love this quilt! I am not much of a quilter yet...just starting out...more of a sewer...but this one is wonderful! from a distance I see flowers too...I think if people complain about too many pieces in something...they shouldn't make it! Love your quilt and the quilting looks great! 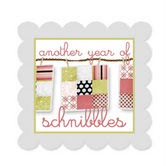 Don't you just love Quilts Plus? What a beautiful quilt! Your piecing is so precise and your color choices are wonderful. Thanks for the close up shots of this one. I enjoyed seeing the quilting up close. Hi Thelma... just checking out your Route 44 quilt. Love it! And your quilter did a marvelous job. Your Route 44 is beautiful! 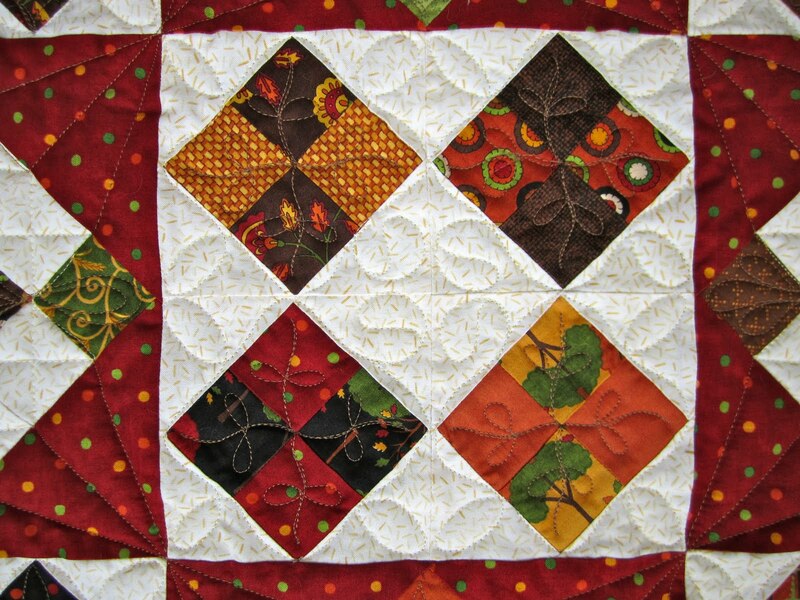 And yes, it's a great transition quilt, summer to fall. I've been on vacation for a couple of weeks, but you sure have been busy!! I think this quilt is really lovely and I love all the pieces--when you try and "batch" sew them, I'm sure they're easily handled. They really do make a quilt! It's fun to see all your quilts and to see your progress on your red/white project. I need to get going on mine (right after the laundry's done! ).